Posted: Tue Nov 05, 13 2:16 pm Post subject: Mini customer survey - if you've got two minutes? 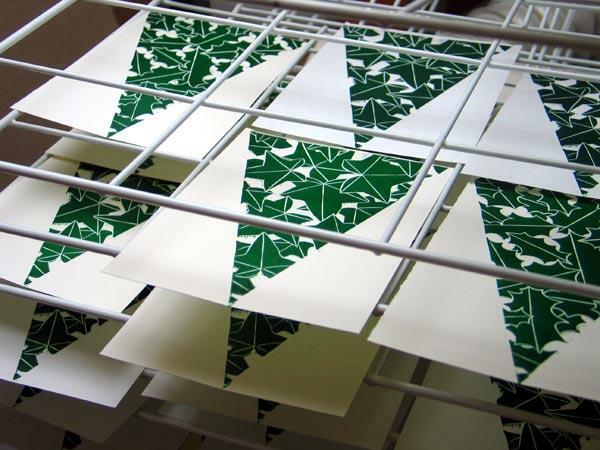 To complement/supplement my major print undertaking, the Twelve days print series for this Christmas, I'm in the middle of making some hand-printed, waxed Christmassy bunting. I've got two blocks, one holly, one ivy. The bunting will come in two lengths - door/window size and chimney breast size. 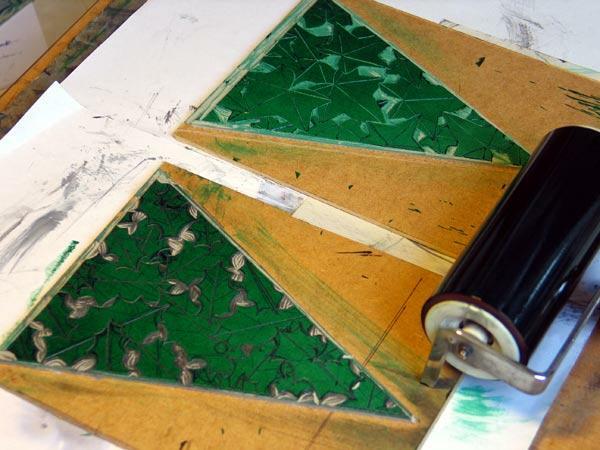 The flags will be waxed ...which makes the non-printed bit translucent, and strung on two-tone (red/green I hope) twine. 2. Three options - Holly/ivy mix, only holly, only ivy. and finally, I was wondering about doing assembled bunting and 'kits' - or is that a bit too much faff for people at Christmas when they've already got a thousand things to do? Holly, and Ivy, ready to go. The song does not suggest you deck the halls with holly or ivy, nor that you have to assemble it yourself. Just lovely, rich, emerald green foliage. holly and ivy mix, though choice is always good. kits might well be good yes, particularly if it is cheaper. And sell it by the metre, or 2m, or whatever fits the flag size best. ETA. I didn't spot the bit about the sizes you want to sell it in. But, how big is a window? Or a chimney breast? Mixed and by the metre. Personally wouldn't buy a kit, and I'd like it in nice long lengths that I could cut to fit my own windows/chimneys. Mixed, by the meter, no kits. The 'flags' will be attached so that they can slide along the twine, so they will be adjustable if people really want to shift them - and have different spacing along the twine or at the ends.